I’m Micaela Lara Cadena and I am humbled to be running for the New Mexico House of Representatives District 33 seat. I believe in democracy and am proud that my New Mexican values have shaped me to be a strong candidate for this seat. I grew up in District 33 as the eldest of three daughters to hard-working Democrats. As a little girl growing up in Mesilla, I was blessed to have my grandparents as next door neighbors and extended family across the Mesilla Valley. I played in the acequia behind my family’s house, saw the seasons change with the pecan trees surrounding our home, and grew a deep love for the place and the people I come from. As a generational Chicana with deep roots here, I am honored to be raising my daughters in the place that taught me everything I know about traditions, family, and community. I am running because I believe we can make government work for all of us and because our district deserves a candidate willing to listen and learn from voters about what matters most. 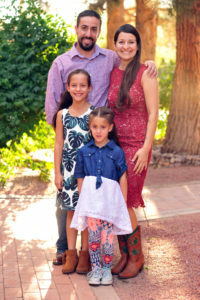 As a mom, I am committed to making sure southern New Mexico has a stake in economies of the future; I understand our families need real opportunity to live here, work here and stay here. As a daughter of educators, I believe that our children deserve education that prepares them for the changing world. I am ready to work with the Las Cruces Public Schools to make sure state funding comes down to where it’s needed most. Representing New Mexico State University is a privilege. Connecting to students in meaningful ways, highlighting the incredible things happening at the university, and pushing to make sure our young people are ready for the jobs of tomorrow is important to me. As a policy maker, my experiences in effectively improving access to health care for New Mexicans and leading criminal justice reform make me well-suited to work alongside providers in our community in building a new foundation for the behavioral and mental health care systems destroyed by the Governor’s administration. Tiny me with my parents, Dolores and Michael, and my incredible hermanas Mireya and Denicia.